Disney Donna Kay: Disney Party Boards - Happy Birthday Mickey! Disney Party Boards - Happy Birthday Mickey! Today is a very special day! It's Mickey's Birthday and I couldn't think of a better way to celebrate than a Disney Party Board! Happy 86th Birthday Mickey Mouse! Mickey Food Table - There are so many things I love about this food table from Hostess With The Mostest! I love the simplicity of it, not too many patterns or designs, just an awesome chalkboard art as the focal point. Even the choice of platters and containers allow the food to be the star. Mickey Cups - So cute and simple! I'm Quite Crafty did a great job, and you could even add real white buttons for some added texture. Mickey Name Sign - ...At Studio D did such a great job with this name sign designed with Mickey in mind. It's designed using a wood board with letters you can find in your local arts and crafts store. Mickey Rice Krispy Treats - Why not bring some of your favorite Disney Parks snacks into the party, just like The Blairs did. Here we have a perennial favorite of rice krispy treats, but you could do your favorite cupcakes or candy apples or even a dole whip! Mickey Cupcakes - These cupcakes from The Sellers are adorable, and very doable. Remember cupcake wrappers lose their color when you bake the cupcakes. You can use white cupcake wrappers for baking then place them in a new red wrapper after they have cooled. Mickey Photo Booth - I love this Mickey Frame that K+P=3 used for their birthday party. You can find lots of Mickey photo props on the Internet to make yourself, or you can always purchase some on Etsy. The key to great pictures from a photo booth is a good backdrop. Black and white Mickey wrapping paper or fabric would work great, for an even simpler verson chose plain red. Mickey Utensils - Alisha Kay Designs on has these cute cutlery sets for sell on Etsy and what could be simpler than just opening the box and displaying them? If you want to make your own version, recreating them should be pretty simple and it's something you can do ahead of time so you don't have to worry about making them on the day of the party. Mickey Trail Mix - The Blairs did it again with this trail mix that is a nod to Mickey. I think the key to making this so cute is the red, yellow and brown M&M's, so be sure to add plenty. More chocolate is never a bad thing!! Mickey Pizza - This pizza made by My Boys & Their Toys is almost too cute to eat! To make it even better - everyone loves pizza so it's a crowd pleaser too! Mickey Cake - How awesome is this cake - and the link is to a tutorial from Rose Bakes so you can make your own Mickey cake, complete with mouse ears! Mickey Pretzel Rods - Another favorite from Goody's Candy Company here - and Robyn's Online World has a tutorial for making them at home. Dipped pretzels are so cute, but they are really easy to do. 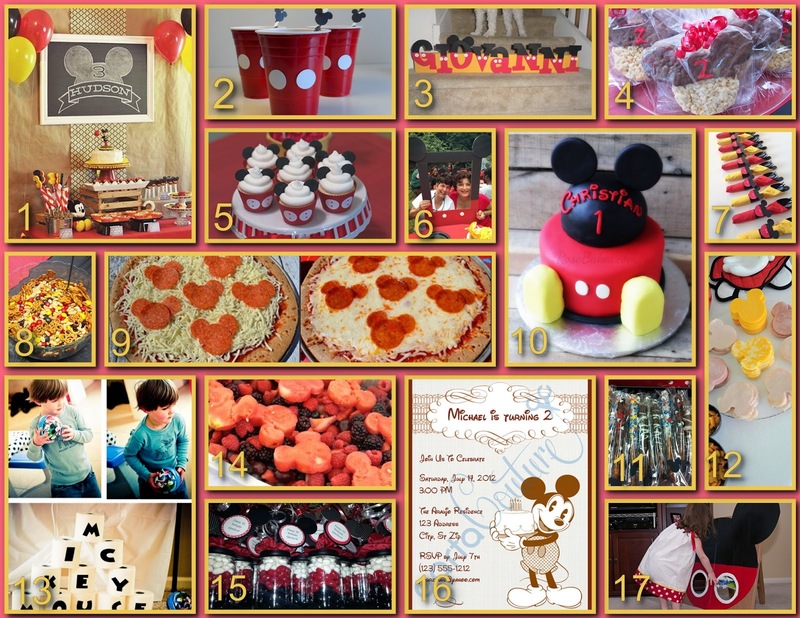 Mickey Sandwiches - Kara's Party Ideas is one of my go to sites when planning these party boards. I knew I would find something, like these Mickey Icon sandwiches, I just had to put on this party board. Mickey Bowling - Here's a party activity that is so easy and fun! Stack toilet paper rolls that had been marked to spell out Mickey Mouse. Have the kids knock them over throwing or rolling a ball. Another great idea I found at Kara's Party Ideas! Mickey Fruit Salad - Watermelon is always a hit with kids -and me!! Use your cookie cutters to make Mickey shapes and add with other favorite fresh fruits to make a easy and healthy addition to the party fare. Thanks again Kara! Mickey Favors - These cute little party favors (which double as decor) are from Stinkystuff's shop on Etsy. You could make your own version using red, black and yellow jelly beans with a "thank you" tag attached. Mickey Invitation - These vintage Mickey invitations from CartaCoture on Etsy are fabulous! I would love to have them for a party of my own! Mickey Bean Bag Toss - The Sellers made this bean bag toss from cardboard. Have a line for preschoolers, one for young kids and one for bigger kids. Fun Mickey prizes from Dollar Tree or Walmart are easy to find. If you have any Mickey Birthday Party ideas to share I would love to hear them. You can share them in the comments below. Happy Happy Birthday Mickey! I hope you have a Magical Day filled with Pixie Dust! !